Have left over rotisserie chicken? 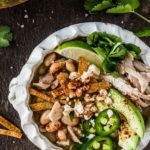 Then, this easy speed scratch green chili enchilada soup is for you. It comes together in less than 30 minutes and tastes amazing. Saute onions and garlic in olive oil until soft. Add all remaining ingredients and simmer for about 30 minutes. Serve with optional toppings of sour cream, shredded cheese, cilantro, chopped avocado and tortilla chips, etc. Cut tortillas into strips or triangles and place in a bowl. Drizzle with grape seed oil. Sprinkle with salt and smoked paprika. Bake at 375 degrees for 5-10 minutes. Remove from oven and flip. Return to oven for 5-10 more minutes or until crispy.